Above: Chanting “Hey, hey, ho, ho, poverty wages got to go,” employees picket the main entrance of Hopkins Hospital on Orleans Street. While more than 300 employees marched outside the main entrance of Johns Hopkins Hospital today, about a dozen stood in front of a side service entrance to mount a lower key, but still passionate protest. “America’s best hospital? It’s also America’s worst paying hospital,” said Bob Domulevicz, a clinical engineer who said he’s worked there for nearly 20 years and planned to stay all day on the picket line. The men, most of them plumbers, electricians, painters and other skilled employees, expressed frustration over everything from pay and parking (“It’s over $100 a month!”) to the items handed out at the annual Employee Appreciation Day. “Last year it was an eyeglass chamois,” said plumber Ed Tull, who has worked for 19 years at Hopkins. 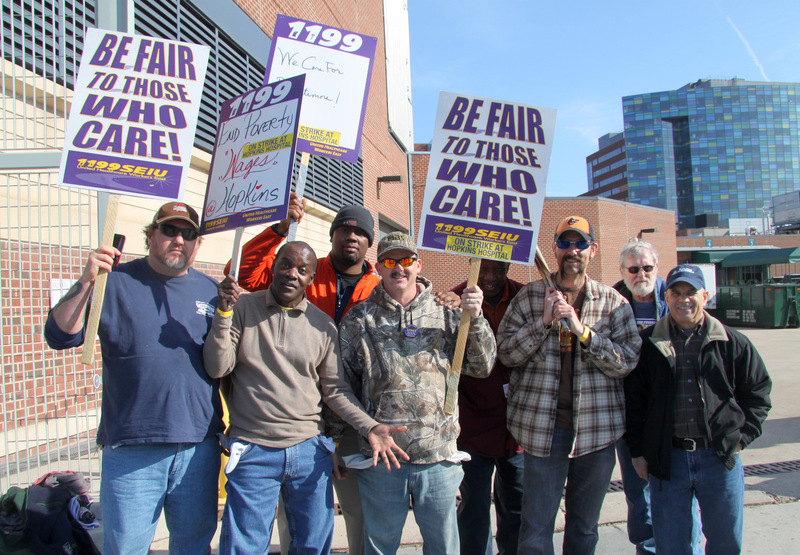 1199SEIU United Healthcare Workers East, which represents 2,000 Hopkins service and facilities workers, called for a three-day strike after negotiations last night failed to reach an agreement. A union spokesman said the workers rejected management’s offer of a pay increase that would have averaged less than 2%. Hopkins officials, who say they have been bargaining in good faith, put strike contingency plans into action today, warning employees in a memo to wear identification badges at all times and saying some shuttle bus stops might be moved to avoid pickets. Domulevicz, who makes $24 per hour (“This after 20 years. I started out at $12”), acknowledged that other striking workers have it worse. Wages at Hopkins range from $10.71 per hour to $27.88 per hour. The union says about about 1,400 of its members there are paid less than $14.91 per hour – the rate that qualifies a family of four for food stamps. 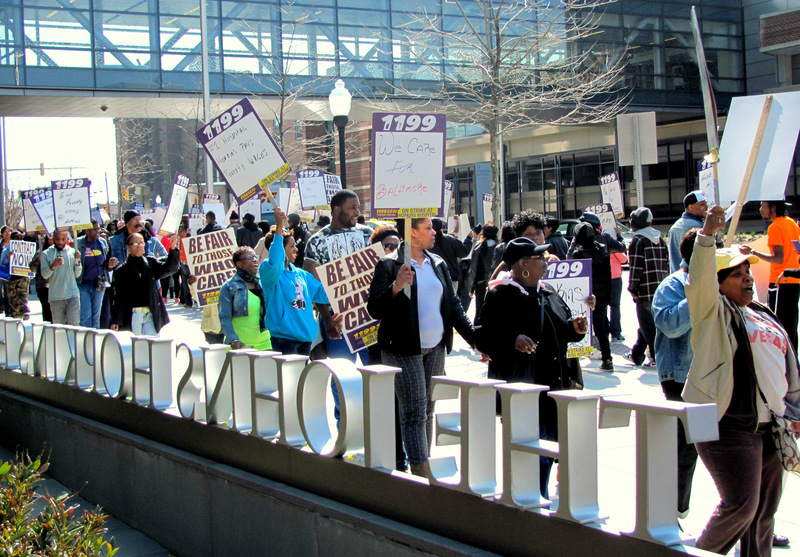 1199SEIU seeks to establish a $15-an-hour minimum wage for workers with at least 15 years experience over four years. Late yesterday, hospital management offered a minimum wage of $12.25 an hour, which would take effect in 2018. The strike will continue until 6 p.m. Friday, said union spokesman Jim McNeill. He emphasized that the union gave Hopkins a 10-day warning of a possible strike to make sure that patient care did not suffer. Asked for comment by the media, the hospital’s position has been that management does not negotiate with its employees through the media.